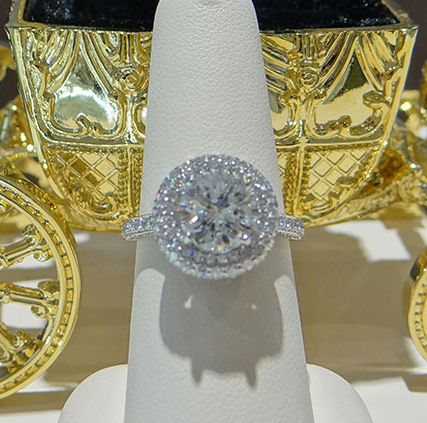 Selecting an engagement ring is a very personal decision. It takes a lot of time, thought, and creativity. The staff at Greens Jewelry is well-versed and is here to help. We are aware of the latest trends as well as classic designs, which gives us a unique perspective and the creativity to create the exact engagement ring of your dreams. We carry a variety of designers or we can create a custom design to suit your needs. Collaborate with our artisan jewelers to design and create a one of a kind masterpiece: custom jewelry is the ultimate way to mark your most treasured milestones in life. A diamond cut refers to the angles and proportions a diamond craftsman uses to unleash the potential brilliance of a diamond. Cut is graded from "Excellent" to "Poor.” The better the cut, the more brilliant the diamond will appear. Cut is the only characteristic of a diamond that is not determined by nature. Clarity depends on the presence or absence of tiny inclusions, or birthmarks, which occurred when the diamond was forming. The size, quantity, type, location, and color of the inclusions will determine the grade. Generally, inclusions are only visible to the unaided eye when the diamond is graded I1 or lower. Color refers to the presence of any color in the diamond. The closer the diamond is to colorless, the higher the grade and the more valuable. A change of one or two color grades is unnoticeable but can have a profound effect upon the price. The Gemological Institute of America (GIA) developed an alphabetical scale to represent a diamond's color. The top of the scale is "D" and it continues down to "Z,” where the diamond displays obvious color. This is a unit of weight for diamonds and other gemstones. Since larger diamonds occur less often in nature, value increases with carat weight. For example, two half-carat diamonds will cost significantly less than a single one-carat diamond of similar quality. It’s important to remember that a diamond’s value is determined using all of the 4Cs, not just carat weight. Insure your jewelry’s true value and the memories behind each piece with the only insurer specializing exclusively in jewelry insurance for more than 100 years – Jewelers Mutual Insurance Company. Less the worry of a larger, more painful loss. Rates depend on where you live. But for most people, purchasing coverage from Jewelers Mutual will cost 1-2% of the value of the jewelry. To learn more talk to the professionals at Green’s Jewelry.